The Blind Spot Monitor is a system that assists the driver in making the decision to change lanes. The system uses radar sensors to detect vehicles that are traveling in an adjacent lane in the area that is not reflected in the outside rear view mirror (the blind spot), and advises the driver of the vehicles existence via the outside rear view mirror indicator. Pressing the switch turns the system on or off. When the switch is set to on, the switch’s indicator illuminates. 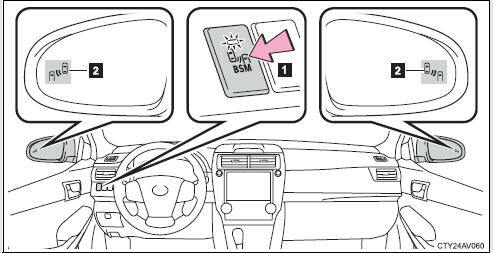 When a vehicle is detected in the blind spot, the outside rear view mirror indicator on that side illuminates. If the turn signal lever is operated when a vehicle is in the blind spot, the outside rear view mirror indicator flashes.